Our grease fitting relocation hoses can be installed in single or dual line configurations. Most of the time, bearings only have one grease port and require only a single grease fitting relocation hose. Dual line system showing supply and discharge grease fitting relocation hoses. Some larger bearings have two grease ports, usually on opposite sides of the bearing. One of these ports will have a grease fitting installed to supply grease to the bearing. The other port is the grease discharge port and is fitted with a plug. When greasing these bearings, the plug is removed and grease is injected through the grease fitting. this allows the old dry grease to be forced out of the bearing by the fresh new grease. After lubrication, the plug is reinstalled into the discharge port. Bearings that have both a supply and discharge grease port can be greased remotely. Two grease fitting relocation hoses are needed. 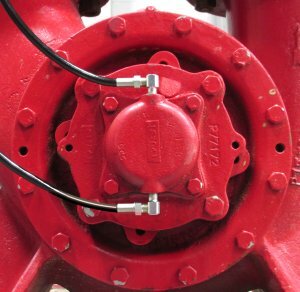 One hose becomes the supply hose and has a grease fitting installed at the remote bulkhead location. The second hose becomes a grease discharge hose and is fitted with a plug at the bulkhead location. The procedure for greasing a bearing with dual extension hoses is the same as if no grease fitting extension hoses were installed. The plug is first removed from the bulkhead end of the discharge line. Grease is then injected through the supply line grease fitting. Old grease will be discharged through the discharge line. The discharge plug is then reinstalled. A diagram of our complete grease extension hose system, can be found on our System Overview page. This diagram shows the installation of an optional discharge line of a dual line system.